The term “green chemistry” is commonly used to describe chemical procedures which meet specific requirements with regards to the conservation of resources and protection of the environment. 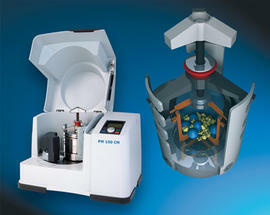 The objective is to avoid undesired by-products by selecting adequate reaction procedures and media. A typical example is the production of bio fuel which has become an ecologically friendly alternative for many drivers. The chemical industry is making great efforts: To reduce the required amounts of chemicals and energy, more and more innocuous reactants, alternative solvents and new synthesis procedures are used. A critical factor in chemical synthesis procedures is the use of organic solvents as these are often harmful and also expensive. Moreover, it should be taken into account that solvents and educts which have not reacted require subsequent separation from the product. The ideal would be to carry out syntheses without solvents and with a yield rate of 100%. In the 1980s a first review of the advancements in tribochemistry and mechanochemistry was published. These terms comprise chemical reactions which take place under the influence of mechanical energy (e.g. friction or ultrasound). These reactions occur on the interfaces of solid materials, therefore, no solvents are required. Moreover, with stoichiometrical net weights, yields of 100 % can be achieved which would not be possible with conventional methods. Solid-solid reactions require large surfaces and a close contact of the educts. Therefore, laboratory mills are especially suitable for this type of reaction because size reduction enlarges the surface of the particles; moreover, a constant mixing with high energy input takes place. Ultrasonic applications are similarly effective, however, it is rather difficult to extend the production to a technical or industrial scale. Fig. 1: RETSCH Mortar Grinder RM 200. Mortars have been used for ages to grind and homogenize solid substances. With the introduction of the first motor-powered mortar grinder in 1923, the so-called “Retsch Mill”, the use of mortars was drastically simplified. The Retsch Mill is permanently updated and optimized: the latest model RM 200 is equipped with a high-performance drive with electronic control. A mortar grinder has the advantage of being an open system which means that the material can be fed in continuously (similar to a dropping funnel in classic laboratory synthesis). However, the synthesis conditions such as pressure, temperature, degree of size reduction and particle size distribution can only be controlled in a limited way. That is why closed systems are more widely used as reactors. For laboratory-scale procedures ball mills are best suited, especially planetary ball mills and mixer mills. Fig. 2: RETSCH Planetary Ball Mill PM 100 CM. The grinding jars of the planetary ball mill are arranged eccentrically on the sun wheel. The rotational movement of the sun wheel is contrary to the rotation of the jars. The grinding balls inside the jar are subjected to superimposed rotational movements, so-called Coriolis forces. The speed differences between balls and jar result in the interaction of frictional and impact forces, releasing high dynamic energies. The interplay of all these forces results in the very effective energy input of planetary ball mills. It has to be taken into account that a high energy input always causes a temperature increase inside the grinding jar. This is especially undesirable for exothermal reactions, that is why Retsch offers the Planetary Ball Mill PM 100 CM which operates in centrifugal mode. The speed ratio of sun wheel to grinding jar is 1:-1, in contrast to 1:-2 or higher in classic Planetary Ball Mills. In practice, this means that the temperature inside the grinding jar is much lower if the mill works in centrifugal mode. (Fig. 3). The powerful and maintenance-free drive of the Retsch Planetary Ball Mills guarantees a constant speed even for continuous operation and long-term trials with maximum load. Thanks to the programmable starting time the mills can be started at night so that the grinding process is finished in the morning. A built-in fan with standstill monitoring cools the jars during operation. The extraction volume per hour is greater than the 20-fold grinding chamber volume. 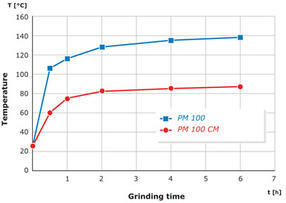 To control the synthesis conditions more effectively, the measurement system PM GrindControl can be used to monitor and document the temperature and pressure inside the jar during operation. This is especially useful for condensation reactions where gas is released because the end of the reaction process can be deducted from the pressure curve. Fig. 4: RETSCH Mixer Mill MM 400. In Mixer Mills synthesis times are shorter due to the more effective mixing process compared to Planetary Ball Mills. The grinding jars perform radial oscillations in a horizontal position. The inertia of the grinding balls causes them to impact with high energy on the sample material at the rounded ends of the grinding jars and pulverize it. 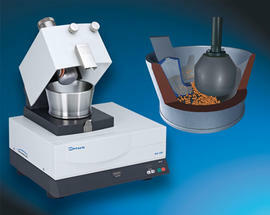 The movement of the jars combined with that of the balls results in a thorough mixing of the sample. Therefore, Mixer Mills are especially suitable for laboratory-scale screening. Together with Professor Kaupp of Oldenburg University, Retsch develops new ideas for mechanochemistry. Their research work does not only concentrate on new synthesis methods but also on the development of mills which improve the reaction process. 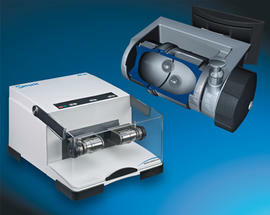 Retsch’s new Mixer Mill MM 400 offers the possibility to produce sample series and influence ambient conditions (e.g. by pre-cooling the grinding jars in liquid nitrogen). Mechanochemistry is a very effective method to carry out syntheses without solvents and by-products. The technical literature describes a great number of reactions where a conversion of 100% is achieved. A precondition for the establishment of mechanochemistry in the industrial sector is the availability of suitable laboratory mills. A decisive factor is that – similar to conventional preparative chemistry – ambient parameters such as pressure and temperature can be documented and monitored. The Planetary Ball Mills and Mixer Mills from Retsch fulfill these requirements.